Elliebelly Knit & Dye Works > Blog > Dyeing > Overdyeing: Can You Change The Color Of Yarn You Don’t Like? Overdyeing: Can You Change The Color Of Yarn You Don’t Like? A knitting friend came to me recently with two different types of yarn. She was no longer in love with the colorways she had purchased some time back. The question was, could her yarn be overdyed. While the answer hinges on a lot of variables, the short answer is, yes and we did it! This is Blue Sky Alpaca's Alpaca/Silk blend. I started by gently untying the skeins to cut a few test strips of each yarn. We selected the gray overdye for the Seasilk and the Blue for the Alpaca/Silk. Into the dyebaths they went. First, the hot pink Silk/Alpaca. Obviously, this process is not for the faint of heart. But at the end of the day, the search for new colors was a success, and due to careful soaking and washing to open the fibers and strip off any finishing products that might have prevented even dye uptake, the results were incredibly lovely. The hot pink became an incredible, deep, rich blue and the Sea Silk a gray with undertones of lilac and lavender. In each case, the yarn dyed up true to the sampling we did. Although you have to weigh your dye to give this type of replicated result rather than measuring, which is easier, in the long run, it is worth weighing your dye and recording recipes by weight not measurement, to attain the predictability. And in order to overcome some rather strong colors, I mixed a very strong dye bath, using almost twice as much dye by weight as I typically do. 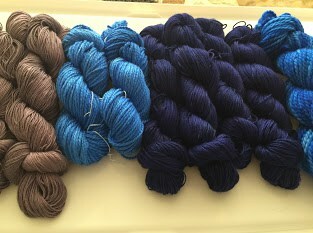 As a comparison, the photo below shows the blue overdye lined up with some undyed skeins that went into the same dye bath. You can see the influence of the pink on the resulting blue. Life is too short to knit with bad yarn, and the same is true of color. If you don't like it, overdye it. They are so beautiful! That blue – wow!